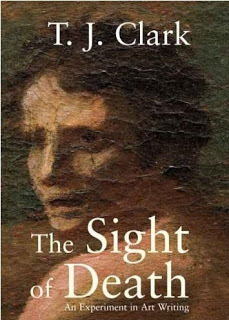 The first thing to be said about this book is that it can't possibly be adequate to read it as an investigation of the way a painting changes through time. The book's just too intelligent, and does too many things, for that to be simply true. It is what Clark announces as his theme, and critics have taken him at his word, but the book also has other purposes and leads in other directions. The subtitle is the better guide here. I take it that "writing," in a capacious and political sense, is what's at stake here. Voice, in this book, is several worlds away from what happens in Krauss's book, but there is a thread of similarity. Here, again, readers are kept at a certain distance. I don't think this is at all purposeful on Clark's part—really, it's the opposite. But it happens nevertheless. Right at the outset, we're introduced to a reluctant author, who hadn't imagined his project as a book, who hasn't studied Poussin in any systematic way. That same potentially sympathetic figure then happens to remember "his favorite line" of Poussin's in the original French (p. 3). For me the end of the book's opening gambit that readers might see along with its narrator is a passage on p. 30, in which Clark says, parenthetically, "(Remember Chantelou's room with the Sacraments, each behind its separate curtain.)" I am an art historian, and I do have an unsteady memory of a graduate seminar at the University of Chicago in which we considered Chantelou's collection. I bet most art historians don't have that memory, and clearly no one outside art history will. Only graduate art historians who specialize in the 17th century will be sure to have such a memory, and Clark's gesture here closes off the possibility that he is writing with us: in fact, as the book develops and the politics becomes explicit, it's clear he is writing in "reactive," mode, mainly against us, at least in so far as we embody the desperate state of image culture that characterizes the present. I confess that I came late to this book, because I had been teaching and reading Clark's Farewell to an Idea for years (I have two copies, both with margins entirely filled), and when The Sight of Death appeared, Poussin seemed to be just the wrong subject to raise questions about politics and current culture. Poussin: one of the canonical dead white males, subject of august, now unread monographs by scholars like Anthony Blunt, and rum interventions by writers like David Carrier. And Poussin, ideal carrier of some of Clark's less sympathetic ruminations, in Farewell to an Idea, about aristocracy and the intellectual life. Clark's style in Farewell to an Idea was untrammeled by editorial corrections, and even after many re-readings I had difficulty with some choices of image and diction that seemed plummy or precious. ("Fruity," as someone I know said: that was rude, but somehow not out of bounds.) So when I opened this book and saw poems with lines like "People like him have stepped into the same river twice" (a coy, intellectualizing allusion to Heraclitus), I thought I might wait. Clark raises this sort of question once in The Sight of Death, when he exclaims impatiently about readers who might think his book, and his choice of artwork, is "elitist" (p. 122). I wouldn't call an interest in Poussin "nostalgic or elitist," but I would call it infelicitous. The very people Clark needs to confront about their culture of "image clarity, image flow, image depth, and image density," and the image's supposed hegemony (which goes hand in glove with the thinness of the "cladding" of the visual on the verbal, p. 176)—those very people are the ones who will not read a book on Poussin. Clark really does miss the shape of the cultural distance involved: perhaps he needs to spend more time in minor educational institutions. I mention this because it goes to the question of the book's voice. It's intimate—I can hear him mumbling to himself in the Getty, just as he hears Philippe de Champaigne's "quiet voice in the shut-down rooms" in Chantelou's chateau (p. 73). But it is also distant and reserved in ways that are not entirely justified by the book's content and purpose. Reading this book in seminar, some students wondered why he didn't say more about the circumstances of his seeing. Weather gets a look in, and there are many mentions of the lights in the museum. But the Getty—I was there the winter Clark was writing this—is a particular and peculiar place, and Clark was living two minutes' walk from the museum. Surely other things that happened on those days, even if they were only moods or stray comments by "Anne" (his wife, who is mentioned in the text but not the index), could have been just as germane to the narrative. There were self-imposed rules in the making of this diary, or book, and that is natural: but those rules are not easy to guess. It's an authorial voice that keeps its privacy, which is also entirely appropriate and understandable: but what counts as private, and what public, is not at all clear, and that creates another obstacle to understanding both the voice and the project. My best guess about why some things are omitted is that Clark was feeling the residue of disciplinary expectations. I hope that isn't true, but if it isn't then the book itself offers no further explanation, and that itself is a flaw—especially in an author who says that he wanted even his books on the 19th c. to be read as "historical allegories" about the present (p. 185). A word about his poems. The first, "Landscape with a Calm," strikes an intentionally informal, almost desultory tone. The poems are inheritors of Larkin, Kavanagh, Lowell, and others (with pinches of O'Hara), so they present themselves as both spontaneous and carefully composed—in general emulation, I take it, of the Poussin paintings. 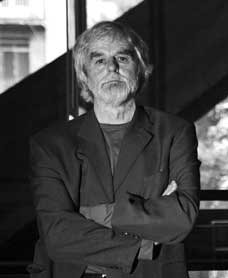 Because Clark says at one point that he thinks that ideally, poems are better at addressing visual art than prose (poetry "would be the highest form of criticism," p. 53), it is necessary to ask what qualities, however muted by the poems' admitted shortcomings, might pertain to them as poetry that would give them the edge over prose. For me at least that answer is terribly unclear, and its unclarity undermines my allegiance to Clark's serious purpose. Could poems contribute a different sense of imagined voices? Synesthesic images? Sentence fragments? If Clark had said more about this, I would have been more likely to follow him further into the more speculative passages in his diaries. By which I mean the book as an object: its trim size, its layout, the way a reader goes from text to images and back. It is clear that Clark had some interaction with a design person at Yale University Press, but it's also fairly clear there were limits both to what the press could accommodate, and to what Clark may have been interested in pursuing. 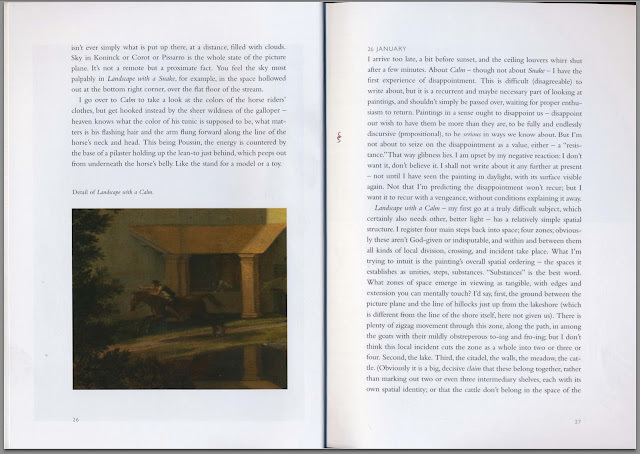 The book is full of helpful repetitions of details of the paintings. Sometimes the registration of reference to image is perfect: when you turn the page from 19 to 20, the phrase "similar cluster of buildings" greets your eye in the form of a detail. Other times it seems Clark decided to show one detail ("ten grazing goats," on p. 28) over some other ("look at the drawing," which isn't visible, also on p. 28). Often, inevitably, details aren't in the right places, or don't show the right bits. There are indications that he did not want readers to think of this book as a designed, formatted object in its own right: it's meant to be a sufficient window on his mediations, not an object whose formatting leads to new meanings. From my point of view—thinking of the history of writing with images, and given that this entire book is about specific encounters with images, which took place under specific lighting conditions—that is unfortunate more than it is inevitable. One sign that the book is not presented to us as an object in its own right, whose successes and failures of layout are to the point of its argument, is a mention on p. 15 of "light on the rump of the horse drinking from the washhouse trough." The illustration on the opposite page does have that rump, but exactly at the edge of the frame. That is expeditious but also funny, and the humor of it isn't mentioned or repeated: it's just a small sign that formatting is not in itself taken to be capable of generating new meanings. Similarly the first detail that cannot be checked in an illustration is Clark's assertion that there are seventeen figures in Landscape with a Calm (p. 17). In an ordinary art historical text, that would be a hint to the reader that it's time to go consult the original artwork; here, the tally seems a bit stranded among the many call-outs that can be checked against the reproductions. The book does have call-outs, but only the ones Clark really needed. Most images are uselessly, and pedantically, captioned "Detail of Landscape with a Man Killed by a Snake" and so forth. I can well imagine the habits of the university press, and the supposedly incontrovertible rules of the copyright holders, that made these captions possible. Mainly, and at heart, the book is a continuous narrative that flows around uncaptioned images—my informal definition for the project of which this text is a part. Much of this book is ekphrastic, inch by inch description and pointing, and pondering that activity is one of the book's preoccupations and also, it turns out, one of its motivations—possibly even a stronger one than seeing how meanings develop through time. This is idiosyncratic ekphrasis, to say the least of it. And before I go on, it may be worth pondering what the smallest features are that can capture Clark's attention, or—to turn the question somewhat—what is the longest he is willing to work at explaining something small. That goes to the elements, as it were, of his ekphrases: what composes the painting, in the end? There are a couple of clues in the book. First, there are the details so small Clark announces them as end-points of seeing. A line of ripples can be seen "bisecting" the reflections of the legs of the sheep," for example (p. 63). At one point he wonders why the reflection of the rightmost tower of the citadel seems slanted. "Somehow," he says, the tower "seems tilted" (p. 34). He doesn't return to that, or solve it. And it is a mighty small problem. I think it can be solved: it has to do with the relative shortness of the reflection, which deprives the tower of its vertical sides. But it is good to know there are limits, both of patience and atomization: they set the terms for what counts as description, and what the painting is built out of. The ekphrases question themselves at every turn. That is because one of Clark's main concerns is to show that writing can't put images into words—that "writing on art is almost never convincing," rarely finds an optimal tone or the right words—but that it does have specifiable responsibilities along those lines (p. 36). It needs to show its inadequacy, and then propose that inadequacy as politics. It needs, first, to be "light as a feather, fast as free association, exact and heavy as a fingerprint" (p. 52). An initial move is to say explicitly that pictures are not logical propositions (pp. 19, 27) or theories (p. 84). More positive is the assertion that ekphrases, or written accounts in general, should "mimic the kind of movement involved" in constructing a painting, for example "the hovering and going to and fro" p. 84). Ekphrasis is embattled in this book most fundamentally because all descriptions must be at least slightly off, slightly infelicitous, and that failure is exactly what needs to be demonstrated. 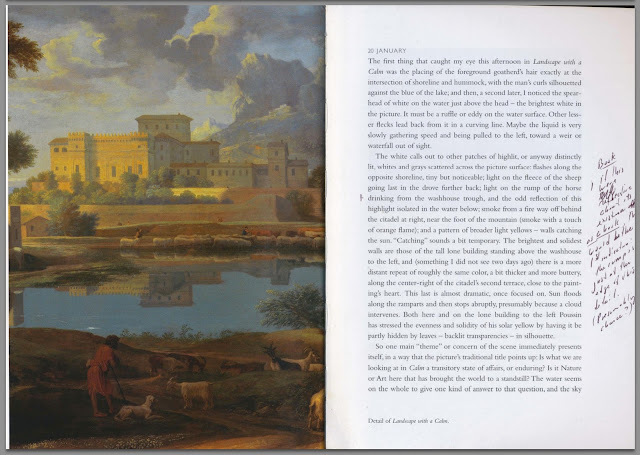 Indeed, the paintings "are the argument" (p. 49), and "the pictures are the beliefs" rather than illustrations, concocted at unreliable removes, of "Poussin's idea of landscape," "his Stoicism, and so forth" (p. 30). This inbuilt, unavoidable, supremely difficult difference between building images and building words is at the heart both of the book's politics and of its limitation as an act of imaginative seeing: more on that in the last section. What, or where, is art history? Clark admits at one point that he doesn't read much art history. "I read so little and give up on so much," he says, because he tends to demand that the writing change his ideas about the art (p. 53). There is plenty of art history in this book, including careful looks at Félibien, Denis Mahon, and some others, but the charge he lays against himself is often said about him. Farewell to an Idea was often criticized for being made in a world of its author's own, apart from the recent scholarship. This kind of distance makes it interesting to ask what counts as art history, and also how this book might count for, or to, art history. It is in several ways outside the discipline, facing away. For instance in the several preambles that get the book started, there are a surprising number of mentions of "meaningless" details. That is reasonable both given the book's diaristic structure—he's just getting started seeing the paintings—and also its theme of how images find words. So these mentions of "meaningless" passages of painting are justified by their unique context, but for that reason not useful for art history. They are supported by their unreproducible context. Here is one more thought on Clark's relation to art history. It's a stray thought, because it responds only to a few passages in the book. I wonder what might plausibly be said about the relation between this book and art criticism. I ask that because in all the 250 pages of indefatigable rumination, there is almost no criticism. When it occurs it really stands out: on pp. 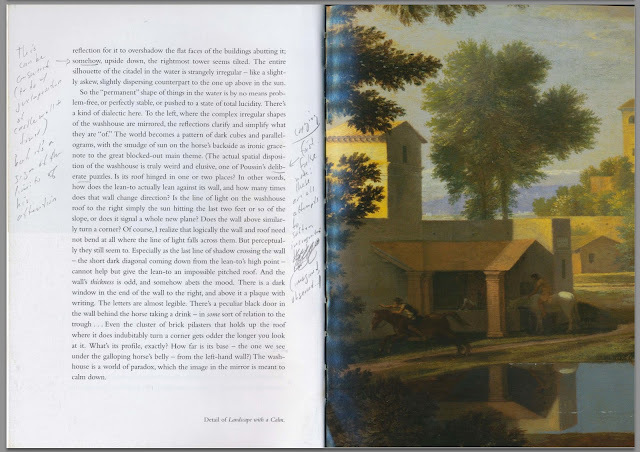 57, Clark mentions some small details in the treatment of trees and bushes in the foreground of Landscape with a Calm that are not "successful," but other than that he is out to learn from Poussin and from his own efforts at seeing and writing about it. But doesn't that kind of emulation, which takes the art as exemplary, go at odds with the book's political agenda? I can't answer this because there isn't enough evidence, but I'd be surprised if it turned out Clark didn't have extensively elaborated thoughts on the ways the Poussin paintings fail (in their context, in their frames, as representations, as political theories, in detail, as sequences). I don't doubt that he could write another book with a trenchant critique of Poussin's project both in the 17th century and for our own century. He's omitted all of that in favor of a patient search for what the painting can still say and do. But why wouldn't a deeper doubt, a more critical pose, have actually strengthened the book's politics, not least by demonstrating an even more patient kind of seeing, on that has to overcome many more doubts? It's the nearly total absence of concerted criticism of Poussin that brings this book closest to art history, and furthest from criticism—and I would like to say also from politics. Here I need to be cranky. This book approaches the feeling and experience of making a painting like Poussin's—by which I mean a Western, post-Renaissance, pre-modern painting, one with a deliberately and incrementally constructed form—more closely than almost any other book in art history. Clark's attempts to write what he perceives as Poussin's methods and his habits into his prose, into his themes, is really exemplary. But for a person who has painted anything resembling Poussin's paintings, and to anyone with an interest in the ways that art history fails to build the bridges that could connect scholarship to making, The Sight of Death is repeatedly incrementally frustrating. I haven't made a special project of making paintings like Poussin's, whatever that would mean. But a number of years ago, I immersed myself in Poussin, and I painted two landscapes—small ones, on panels—that came out of the swim of my experiences with his work. I don't think they exist anymore, but if they did, they would be embarrassing: not because of a lack of technique, I think, but because they would appear to someone who knows Poussin as pastiches, with every passage—every tree and cloud, each sapling and hill and rivulet and field—deriving in an obvious manner from some specific passage in Poussin. That is how my two paintings assembled themselves in my mind as I worked. They are as far from interesting artworks as I can imagine. But I have exact memories of each form in each painting, and my memories of those quotations and collages continue to influence my experience of Poussin: that is because making paintings is an experience whose detail and intensity cannot be matched by any writing. 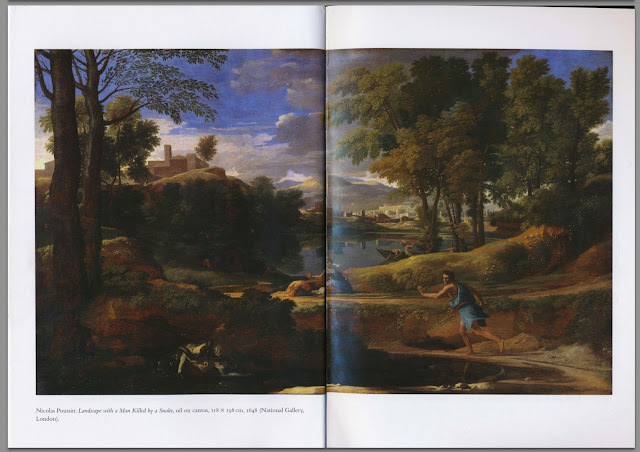 I learned an enormous amount about my seeing, and about Poussin, from those paintings. Over the years I have kept my interest in the lack of relation between making and the field of art history. 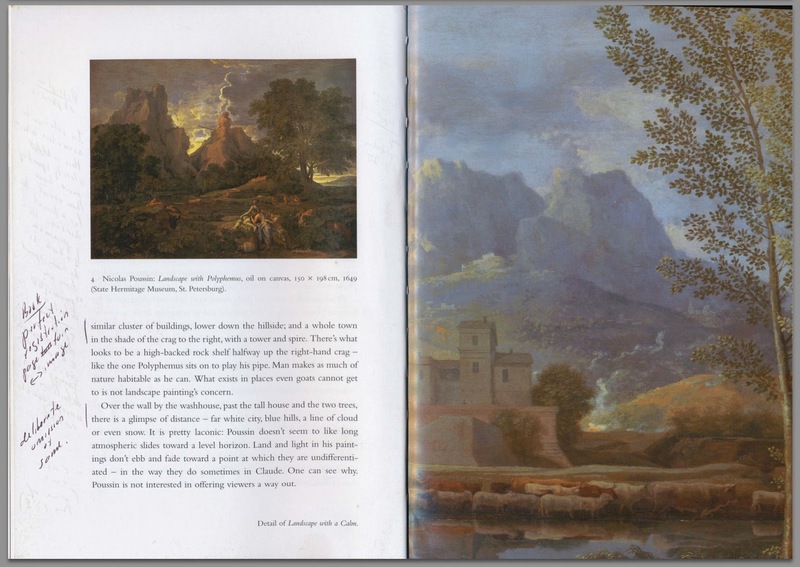 There is an unpublished paper called "Why Art Historians Should Learn to Paint." When I taught a semester at Berkeley, I got the museum rules changed so I could bring students into a basement room and let them try copying paintings. I was disappointed, then, that Tim Clark wasn't interested in visiting our class, even though we were copying Hans Hofmann paintings and he was writing and lecturing about Hofmann at the time for Farewell to an Idea. All that needs mentioning because of what I want to say about what Clark does in this book when he comes to mention Poussin's method. Sometimes he just asserts Poussin's "surprise" and "delight" at "the sorts of equivalent a brush moving in pigment can throw up," and there I have no objection (p. 30). It's unproblematic to say that the citadel and far shore in Landscape with a Calm "are a wonderful miniaturized version of a kind of world-making—a deliberately multipartite, almost modular building of spaces" (p. 32). But in other passages he gets something wrong about the tone or purpose or meaning of what he conjectures Poussin did in paint. It doesn't sound right to say the washhouse in Landscape with a Calm is an example of Poussin's "deliberate puzzles" (p. 34) or that it is "gaming with the very idea of clarity" (p. 56). It seems more reasonable to say the washhouse's ambiguities and spatial irresolutions are results of attempts to soften the impression of the building, which had probably been constructed, perhaps not entirely logically but in "modular" fashion, from invented and remembered parts. 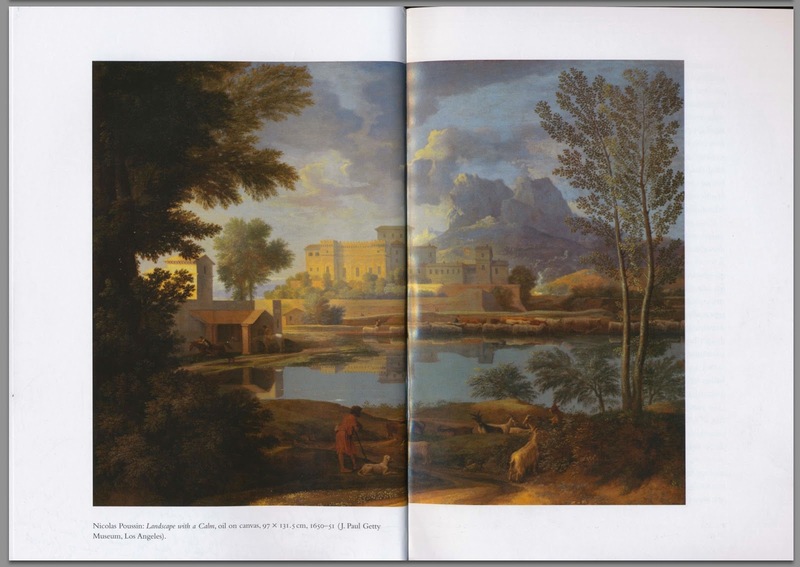 Nor does it sound accurate to say that the far meadow in Landscape with a Calm shows us Poussin "wants to show us" two kinds of seeing, "what both kinds are, and how the truth emerges from the to and fro between them" (p. 60). I just can't square my experience, or my sense of painting's processes, with the idea that the artist was trying to demonstrate something as logical as that—or for that matter that "demonstrate" or even "show" are the right words in a context like this. A painter, or someone who has pertinent experience, would not be likely to agree with Clark when he says "I seem almost to be setting myself the task of recapitulating in words every move in Poussin's process of manufacture" (p. 42). Hardly, a painter wold say, and the approximation should be striking. Similarly when Clark presents himself as being in danger of working like the painter, or a painter, his imaginary viewer (the "painter-beholder," as Michael Fried would call him) can be fairly distant from what a painter might think. "Time and again," he writes, in a passage that continues the one I just quoted, "I imagine a viewer asking what Poussin could have thought was the point of this degree of barely perceptible detail" (p. 43). But surely only art historians would ask, or think of asking, a question like that, and Clark's polemic point here—imagining such a viewer "especially now, in our current state of image production"—is weak because he himself asks versions of this questions throughout the book: he only tries to answer carefully. These sorts of descriptions, in which Poussin is imagined as posing problems, puzzles, or deliberate ambiguities, sound to me as misdescriptions: the effect of careful adjustments, with the mind firmly fixed on the painting's construction, can be passages that appear as puzzles. The difference between those two moments, of making and matching as Gombrich said, is crucial in an account that cares about the mismatch. And, finally, it's worth saying that Clark's account sounds to me as if it misses the pleasures of these various accomplishments in a way that painters, and I think Poussin, wouldn't have. Speaking of the screen of trees at the left of Landscape with a Calm, Clark writes that "in these conditions one sees that the leaves are a complex membrane, sometimes opaque and sometimes semi-transparent, sometimes absorbent and sometimes reflective, through which light pushes irresistibly" (p. 89). When you paint passages like this, over partly completed backgrounds that are full of light, there can be a tremendous pleasure, which can vary precisely as the form of the screen varies. I wonder what an articulation of such a pleasure might have contributed to Clark's account. The big mid-distance screen of trees in Landscape with a Man Killed by a Snake is another case, equally variegated, and so is the birch trees that take up so much space at the right of Landscape with a Calm. Perhaps one way toward this experience would be to imagine the construction of the painting that much more exactly (mechanically): the entire sky wasn't painted when those trees he mentions went in, but some was, and the unseen portions of the sky were effectively created by the act of screening them: something a non-painter can certainly study, and something that certainly helps link the reception with the making. Tim, I assume this post is safely hidden away from you, deep in the world of "image clarity, image flow, image depth, and image density." But if you happen to be sent it, please take it as a sort of unedited diary entry: it exists on the internet, where even drafts too malformed for diaries—not to mentioned edited diaries—can work, hopefully, differently than texts in books. After this material has been out a while, and I have registered people's suggestions, it may grow into something readable in a more normal sense. What a wonderfully inventive way to use blogger. Also love the 'hidden' message to Tim (not sure how 'hidden' anything is on the internet these days...) Please say hello to Margaret; I'd love to get in touch. Typical Western scholar drama: having already sufficient theoretical background to write on any given subject but being incapable, out of the same reasons, to find new and interesting subjects. Good thing I live and write art history in a post-communist country, there's always something intresting to write about. "Writing interestingly' seems to be a self-consuming drive; as almost every contemporary art historian tried to shape up new subjects or, better yet, new methods, "writing interestingly" has become a general method and, therefore, unintersting. This is just an outside view, of someone who every day leafs through the latest Western volumes, always satisfied with what he finds, but never surprised, as he knows that everything might have already been written off. Although a reader, I am not part of your regular public, so my opinion might be irrelevant. This is why I think I should stop. I'm writing this months after bookmarking it, as a 'maker' and someone interested in critical thinking, who came to art/ art history late in life. Actually what I like about you *and* TJC is that your writing lives in the larger world, while having deep knowledge of the narrow specifics of visual culture or art history or whatever (you can see I don't). Like Raymond Williams for Eng Lit.